Slots are one of the most popular casino attractions making about 70 to 80 % of the total casinos' income, primarily as they are so easy and fun to play. In fact, there is no special set of rules defining how to play slots. Nevertheless, to play slots successfully one is supposed to get acquainted with the basic rules determining the process of playing slots. The object of the game is to get money from the slot machine. Due to the basics of how to play slots, one is supposed to insert coins, cash or tickets with barcodes, like in modern Ticket In/Ticket Out machines into the special slot. Penny and nickel video slot games and quarter and dollar reel slot games are the most popular, although there are games in other various denominations up to $100. Most machines include currency acceptors. The player chooses the number of coins he or she wishes to play, the number of paylines and the number of credits to bet on a single slot machine payline. Up to 50 paylines may be available on a slot for up to 25 coins each. To start the mechanism, the player pulls the lever (in classical models), pushes the button or, in the newest hi-tech slots, presses touchscreen on the machine's face. cartoon or movie characters or images of actors and singers, like in the modern themed slots. For example, the player might get one cherry on a payline and get two coins, and three cherries in a row might pay 30. Winning symbol combinations are represented on the face of the slot (or on the second screen in video slots) in slot payouts table. The player who matches the winning combination gets cash or other prizes like additional free games. To collect the coins push the "Cash Out" button. You either get coins from a special tray, as in the retro models, or get a ticket with a barcode that is exchangeable for cash. Most modern slots offer bonus games. The combination of three bonus symbols in a single payline may initiate the bonus game paying either in coin multipliers, free spins or progressive jackpots. Some bonus games may require some skills from the player, like eye and hand coordination, other bonus games are simple video poker games. 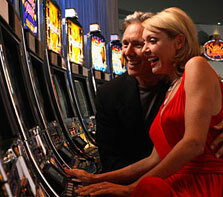 It is fairly easy to learn how to play slots. Slots offer certain advantages compared with other casino games. For example, the slots player is free from sometimes intimidating interactions with other players or dealers and is able to control his or her time and the whole game process. Another advantage of playing slots is huge jackpots that it offers. Slots may or may not include the player's skills, but basically slot games are games of chance only creating the illusion of including skills. That is why to be a success one has to master basic rules defining how to play slots together with the basics of slot machine technology.